It’s fair to say that the ’80s were something of a mixed bag for Elton John. After 1979’s disastrous disco album Victim Of Love, Elton reunited with his estranged writing partner Bernie Taupin. Taupin contributed some lyrics to John’s first three ’80s albums 21 At 33 (1980), The Fox (1981) and Jump Up! (1982) – the latter including Empty Garden, a tribute to Elton’s close friend John Lennon – but it wasn’t until 1983’s Too Low For Zero that John and Taupin wrote a full album together. The album proved to be Elton’s most successful of the decade, spawning the hits I Guess That’s Why They Call It The Blues, I’m Still Standing and Kiss The Bride and re-establishing him as a major artist after several years of only sporadic success. The following year Elton did indeed kiss the bride as he married recording engineer Renate Blauel during the making of his next album Breaking Hearts, another success which included the hit singles Sad Songs (Say So Much) and Passengers. Keeping up the high work rate, 1985’s Ice On Fire was another success, but by 1986 Elton was on the slide. Struggling with a cocaine addiction and a failing marriage, Leather Jackets was made in difficult circumstances and it shows. Sales were poor and John rates it as his least favourite album. Worse was to come though, as in the months after the album’s release Elton underwent surgery to remove nodules from his vocal cords and there were fears that he would never sing again. His last concert before surgery was recorded and released as Live In Australia With The Melbourne Symphony Orchestra – a slow burner, the album finally took off in January 1988 when a live version of Candle In The Wind became a top five hit. Later that year Elton’s self-proclaimed comeback album Reg Strikes Back was released, although sales of this and its 1989 follow up Sleeping With The Past remained disappointing until, in 1990, a double A-sided reissue of 1989 singles Sacrifice and Healing Hands unexpectedly climbed to number 1. 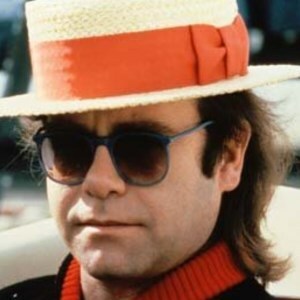 This success seemed to allow Elton to escape his ’80s demons and assume national treasure status in the ’90s, his tireless fundraising for his AIDS charity and rewriting of Candle In The Wind for the funeral of Diana, Princess of Wales earning him a knighthood in 1997. His ’80s work remains undervalued, so here’s a 90 minute trip through some favourites and some gems you may have missed.